1) Below is an arbitrary﻿ triangle ABC to use in your proof. 2) Use the Midpoint Tool to construct the midpoint of sides AB and BC. 3) Use the Rotate around Point tool to rotate point C about the midpoint of AB by 180 degrees. 4) Use the Rotate around Point tool again to rotate point A about the midpoint of BC by 180 degrees. 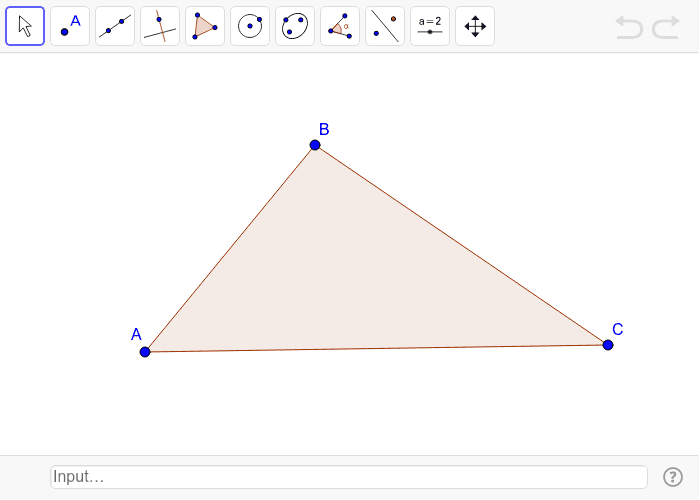 5) Use the Line tool to construct the line through your rotated points. Is point B on the line you constructed? What does this tell you?